In the United States alone, we consume more than 200 pounds of meat per person per year despite the rising trend in plant-based foods and diets. Meat and dairy consumption in developing nations is on the rise with no expectations of abating any time soon. Eating less meat and dairy reduces the risk of chronic diseases, including heart disease, Type 2 diabetes, and some forms of cancer — and, it decreases our carbon footprint and helps to reduce the suffering of farmed animals. Minimizing the global consumption of animal products is a must. While we know the future of our food system needs to be animal-free, achieving that on an international scale is complex, requiring education on local and national levels, legal initiatives, corporate campaigns, and a global shift in behaviors and attitudes. So, the question is… How do we actually achieve an animal-free food system? 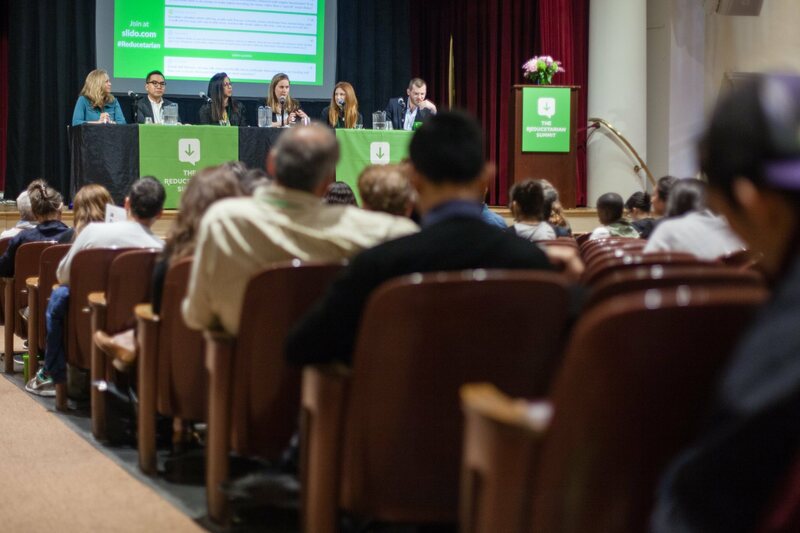 The second annual Reducetarian Summit, held in Los Angeles, September 28–30, organized by The Reducetarian Foundation, brought together people and perspectives from all corners of the world to explore strategies and tactics for reducing societal consumption of animal products and ending factory farming. VegFund was a sponsor of this year’s event and participated in moderating a panel discussion on addressing these issues on an international level. Some 500 participants convened at the summit, including entrepreneurs, investors, philanthropists, journalists, environmentalists, animal advocates, nutritionists, academics, students, and representatives from non-governmental organizations (NGOs) to engage with nearly 100 speakers, panelists, and exhibitors. Alongside moderated panels and inspirational talks, the conference organizers placed a special focus on skills-building and networking. The expo showcased a potpourri of the many delicious plant-based foods now available, adding to the enjoyment of the event. This year’s theme could not have been more appropriate in light of the recent and startling IPCC special report on climate change that emphasizes the importance of a reduction in meat and dairy consumption and the power of individual action. VegFund board member, Stephanie Redcross, managing director of Vegan Mainstream, moderated a fruitful panel discussion with Humane Society International, Animal Equality, Greenpeace U.S., and World Animal Protection U.S., on the topic of taking our animal rights efforts to the international level. What effective actions, strategies, and tactics are being implemented to promote meat reduction in different target countries? How is that effectiveness being measured to determine key lessons and factors of success? How is market variation (supply chain, culture, language, and income) being accounted for when pushing for global change? How can NGOs coordinate their efforts and messages to drive forward a reduction or eradication of global animal consumption? How and where do we start in a market where farm animal welfare is not an established concept or concern? What other sectors and players do we need to include in our efforts to make an impact? What are the key strategic entry points for shifting to “less and better”? What do we do to find, hire, and train the most appropriate people for this work? Panel members provided insightful examples of effective measures that contribute to this global effort. VegFund was honored to moderate such an informative and thought-provoking discussion! A newly released book that further explores this million-dollar question: How do we achieve an animal-free food system? is The End of Animal Farming by social scientist and activist, Jacy Reese. This groundbreaking book outlines an evidence-based roadmap to a humane, ethical, efficient food system without factory farming, exploring the important work of groups and individuals across the world who are paving the way to the end of factory farming. The Reducetarian Summit returns on September 27–29, 2019, in Washington, DC, for another inspiring gathering! Register your interest to receive event updates. The Reducetarian Foundation aims to improve human health, protect the environment, and spare farm animals from cruelty by reducing societal consumption of animal products, and celebrates the small changes in personal and institutional behavior that collectively result in a significant difference in the world.